As a corollary to the above and with the objective of facilitating learning for the preparation for ICAN exam, at the Foundation Level, I have created a Complete video training course on Management Information – IT and Costing, that you can walk through on your own, and give you guaranteed Success in your examination. Also I can bet you, that you will not find this kind of video training anywhere, that teaches you in a very practical and interactive way. You can watch the videos even on your mobile devices. 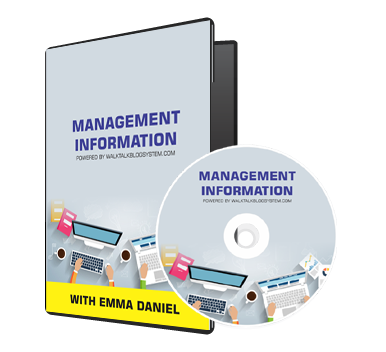 I observed that Management Information comprises Costing Accounting and Information Technology, which I also lecture. The IT part requires practical knowledge and or hands-on experience on the use of computer or familiarity with some IT architecture, in real life. Yet, many students lack these practical knowledge and are not even familiar with these architecture. The text books on IT alone, cannot give them a good level of appreciation of most of the subject matter being discussed except for those who have seen the systems in real life. They make extra effort, trying to commit these knowledge base to memory with only a nodding acquaintance of how the systems work. you see graphic presentation of the IT configuration as it is being explained. Introduction To Cost Accounting:- This Chapter covers the definition, principles, scope and objectives of Cost Accounting. Cost Accounting Framework- This Chapters covers a wide Glossary of Cost Accounting terms with practical examples, cost coding, cost classification etc. Cost Behaviour:-On this chapter, you will learn about the concept of cost behaviour, Cost Behaviour Patterns, Cost Estimation Techniques Plus Practice Problems. Inventory Control:-This Chapter covers inventory control with reference to transaction workflow, control systems, Stock levels, EOQ, Inventory Costing plus practical problems. Labour Costing:-This Chapter dealt with Salaries and wages administration, labour records, Administrative issues such as Labour Turnover plus practical questions. Overhead Costing:-On this Chapter, you will learn the principles of overhead costing, overhead analysis sheet, overhead absorption, secondary apportionment, service costs centres, plus practice questions. Cost Accounting Methods:-This Chapter is divided into 4 sections as follows – Job & Batch Costing, Contract Costing, Process Costing, Service Costing, plus practical questions. Cost Accounting Techniques:- On this chapter, you will learn about Marginal and Absorption costing Techniques and their Applications. Cost-Volume-Profit Analysis:-On this chapter, you will learn how to apply Marginal Costing Techniques to Breakeven Analysis. You cannot find this kind of illustrative style anywhere. A test dive will convince you. Decision Making:- This Chapter teaches you how to apply Marginal Costing Techniques To tactical decision-making problems. It covers four sections which are: – Product Profitability, Limiting Factors, Acceptance Of A Special Order and Make or Buy Decision. The Concepts Of Systems:- Definition, Types of systems, system environment, feedback and control, predictive behaviour of systems, system hierarchy. Computer Application And Decision Making:-Integrated approach, Database etc. System Management And Security:-System Management, System Security, Types of maintenance. Computer Networks And Data Communications:-Types of topologies (Star, bust etc),types of networks (LAN, WAN, MAN), hardware and software components, protocols. MIS Organization And Change Management:-Structure Of MIS organization, functions Of IT departments and key management staff, definition of change management, information systems planning activities, human aspects of change, resistance to change, re-engineering a business process, change procedures -acquisition, implementation, documentation etc, conversion -Parallel run, pilot, direct and phased conversion.